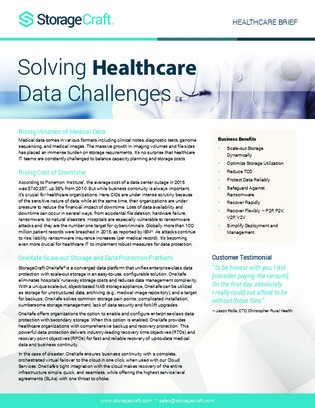 While healthcare organizations have unique challenges dealing with a disparate array of data formats—clinical notes, diagnostic tests, genome sequencing, and medical images—many organizations, regardless of industry, struggle with massive data volumes that place an immense burden on storage capacity and costs. To resolve the big data volume issue, this resource introduces StorageCraft OneXafe, a converged platform that unifies data protection with configurable, scale-out storage to simplify heterogeneous data recovery and management – a solution that’s suitable for the healthcare orgs but equally appropriate for any organization struggling with heterogeneous backup environments. View it now for OneXafe’s storage, data protection, and disaster recovery features bulleted out.